Hello, sweet Inspy readers. Ginger here. I’ve been struggling for the last two weeks about what to write today. Some months, the words come without much effort, but this month, wow, I can’t seem to get my head on straight or something because nothing is prompting my brain cells to function. NOTHING. So, in lieu of some romantic post, I thought I’d post some pictures from around my house where new life abounds. I’m blessed to live in the south and have all my life. I’m not sure I could deal with all the snow the northeast got this year. Several other Facebook friends are posting new snow pictures. I shouldn’t be surprised. It snowed in May in West Virginia the year my father died. Cute for a few more days. Here is our new batch of hens (I hope). We incubated two of these little cuties, and they’ll be Rhode Island White, though we don’t know if they’ll be hens or roosters or one of each. The other yellow chicks will grow to be White Leghorns. The reddish ones are Gold Sexlinks. I’ve no idea what they’ll be, but I thought they were pretty. 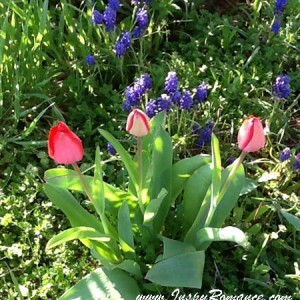 I haven’t had the time or the warm, dry weather to get out and weed yet, but here’s a picture of tulips in my flower bed before my daughter can go out and clip them. I think those are bluebonnets behind them, but I’m not sure. I don’t think I planted those, but I might have. So much has gone into this particular plot that I don’t remember anymore. There’s a large Crepe Myrtle in the center that keeps much from growing. I love the tree though. It’s so pretty when it blooms. 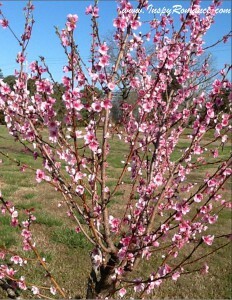 This is a picture of one of our peach trees blossoming. The apples, cherries, and few of the other fruits are getting ready to break out, but this one is the first. These trees are still fairly young, and we’ve had some issues—freezing, wind, bugs, and disease. This is our first try at having fruit trees, so we’re still learning. They produce though, and fruit fresh from the tree is so absolutely yummy. Other things growing in our yard: asparagus, weeds :) , broccoli, kale, and the strawberry plants are greening up. Later in the year, we’ll have raspberries, blackberries, blueberries, grapes, plus the fruit from the trees, and the vegetables from the garden—tomatoes, cucumbers, squash, zucchini, corn, watermelon, and more I can’t think of right now. On that vein, I recently read our own Valerie Comer’s Dandelions for Dinner. While I’ve never eaten dandelions or drunk the tea, and really don’t plan to, I enjoyed the book a great deal and highly recommend it. 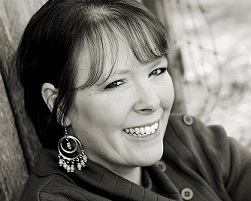 Valerie writes with such a passion for the farm and living naturally. And since I’m recommending books, lol, I’ve also read all the published books by our own Carol Moncado. All good. Type her name in Amazon, and you’ll see her work. Can’t wait for the other two to get out there. I’ve already pre-ordered. See, besides being a writer, you can probably tell I’m a prolific reader. I’m reading less this year than last when I read over 300 books, but I can devour a book in several hours, depending on the length, of course. I love good books and am happy to recommend them to you. I’m sure the books by every writer on this site are good; I just haven’t read them all. YET. What’s growing in your yard? Or what do you plan to grow since I know it’s still winter some places, despite what the calendar says? We don’t grow anything in our yard. We used to have flowers, but when I was pretty young my mother got tired of gardening and stopped doing it. Oh no, Samantha, more snow? Spring will come soon for you, I pray. Love those chickens! I used to have hens back in Australia. I miss them, but our little English garden isn’t big enough or safe for hens, sadly. Ahh…grape hyacinths. That makes more sense. They kind of do look like little clusters of grapes. Thanks for setting me straight, Autumn. The chickens, well, they’re a big hassle at times, but my family enjoys the eggs. I know what’s growing in my yard….weeds! :-D Seriously, I don’t garden or plant or any of that kind of thing. But I do admire those who do, they always have such lovely gardens or flowers & yours is no exception! It’s beautiful in spite of the weeds. I always love seeing the daffodils & purple crocuses coming up in early Spring here in the Pacific Northwest. Also the cherry trees blossoming with their pink flowers. And we sure did have them come up pretty early this year since it’s been warmer then normal temps. Our neighbor has some lovely flower beds, I have no idea what all she has but it’s so colorful! Talking about all that green stuff (and I don’t mean money, lol), my grandma was one to keep a great looking backyard. I remember helping her plant her rose bushes out front, and whatever flowers in the backyard. I even have a picture of some flowers I planted as a kid…..no idea what kind, but they sure were pretty when they bloomed! She also put out bird seed in her many bird-feeders, nectar in her hummingbird feeders & dry corn cobs for the squirrels. She did have the green thumb! I enjoyed the pictures around the house, Ginger! 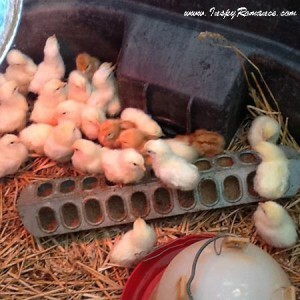 I especially like the chicks, so cute. Do you raise any other animals? And do you sell the eggs? What a super busy time it sounds like at your little fruit/veggie/chicken “farm” ;-) But the outcome of fresh ingredients would be so worth it! As always, Ginger, enjoyed your post today! Especially the lovely pictures you posted of around your house. Thanks for sharing & have a blessed rest of your week!